Candle wax is stubborn and if it gets on your carpet good luck taking it out. The good news is that all’s not lost. It might seem stubborn but it can be coaxed off. Just apply heat to remove it. All you need to do is take a hair dryer to the stuck strands but place a clean cloth over it first! Use a warm iron for the best results and then use a butter knife to scrape off the softened wax. Problem solved. Vacuuming every couple of days makes sense hygienically. It will maintain the look of your carpet, pick up dirt and debris and thus prevent stains. Those fibers are quite sensitive as it is and will deteriorate if they are not cleaned regularly. 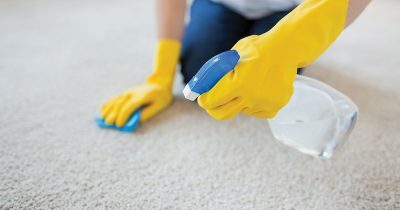 This simple secret will add years to your carpets especially if you have kids in the house. Contrary to popular belief, stains cannot be removed with a good scrub! That is a mistake most people make so you aren’t alone. Rubbing the stain only makes it worse because it gets embedded in the fibers. That is the first reaction when something spills on the carpet, but good luck getting out those stains then! What you should do is blot the fresh stain with a paper napkin first gently. Adding pressure will only make the color spread. Once most of the liquid has been blotted up, take a wet cloth and dab at the area with a mixture of water and bleach. Then leave it to dry and the stain will be gone later. Gum on the carpet is a nightmare for any homeowner. That sticky and gross mess can ruin fibers irreparably but you don’t have to take a scissor to them. All you need to do is take a couple of ice cubes and freeze the gum for 30 seconds. Once the gum gets hard enough, it should be easy to remove. Use a spoon to lift it out and cut strands stuck to it as close to the gum as possible. That way the damage will not be noticeable. If you have a large carpet, steam will do wonders for it. Use a commercial steam cleaner every 6 months to keep it clean year-round. This requires a mix of chemicals and water that can penetrate thick fibers via high powered nozzles. The dirty water can be extracted with the cleaner as well so it will sanitize those fibers for you. If you don’t have time to do all of this yourself, Extra Hands can help. We can send over professional carpet cleaners with equipment that can work on those stubborn stains.